Over the course of a number of years I gave risotto a few more chances. But I kept being unable to come to terms with it. It always seemed too chewy, too soupy, too ricey. It was like my version of the porridge in Goldilocks, except it was never just right (not even three times was the charm). So, I kind of gave up on it. I figured it was probably something wrong with me, how it’s just not really in my bones to love rice dishes, or myriad other excuses. And so it went. But each time I looked at it, it chipped away a little bit more of my anti-risotto predisposition. Until finally one day I decided, ‘to heck with it! It’s worth one more shot!’ So, I made the risotto. And I fell in love. In the process I learned two things: one, even though I think I want a super creamy risotto, the brightness and tang of the lemon in the risotto adds a fabulous dimension that cuts through the starchiness and keeps it from feeling like starch beyond starch; and two, when you make your own risotto you can make it just how you want it. This is what has truly revolutionized my risotto attitude (aka my risottitude). There are certain styles of risotto that may be considered more authentic or proper, including those that leave a crisper center in the rice grains or a brothier medium surrounding the rice. But, I like my rice just barely toothy, and on the less liquid-y side. I like how my risotto turns out when I cook it very slowly. It takes in the realm of 40-45 minutes of steady stirring and broth adding over low heat to get my risotto just where I want it, while many recipes claim you can be done in 20. So be it. It’s worth it. And, maybe this means I have bad taste. But, actually, I don’t really care any more. I used to be really concerned about having the “right” sense of taste. But, I’ve started to realize that I just have my sense of taste, however quirky it may be. This, I think, is an important thing to remember about cooking in general. You don’t have to like something just because it’s the proper or trendy way to make it. Nor do you have to dislike something because it isn’t. I think it’s worthwhile always to be willing to try something prepared in the traditional way, or in a new way, or with an esoteric ingredient you are slightly afraid of. It’s worthwhile to try it many times. Often your tastes will change and expand through exposure. But, in the end you should feel ok about liking what you like. And knowing what you like gives you the freedom to tweak recipes. Because recipes, even recipes from the greatest chefs in the world, are always guidelines, not gospel truth. Ok, that was my food diatribe for the day! At any rate, I have come to really enjoy risotto by making it myself and by experimenting with the flavors. In the winter my favorite is a risotto with sauteed mushrooms, porcini oil, and plenty of sharp cheese stirred in. But, in the warmer months I still love a lemony risotto. The first time I made this version it was completely an exercise in freezer and pantry spelunking. We had almost no food in the house, but I found some old arborio rice and a lemon, plus some frozen shrimp and peas. They all went together into the pot (in a particular order, of course), and what came out was a wonderfully satisfying supper. 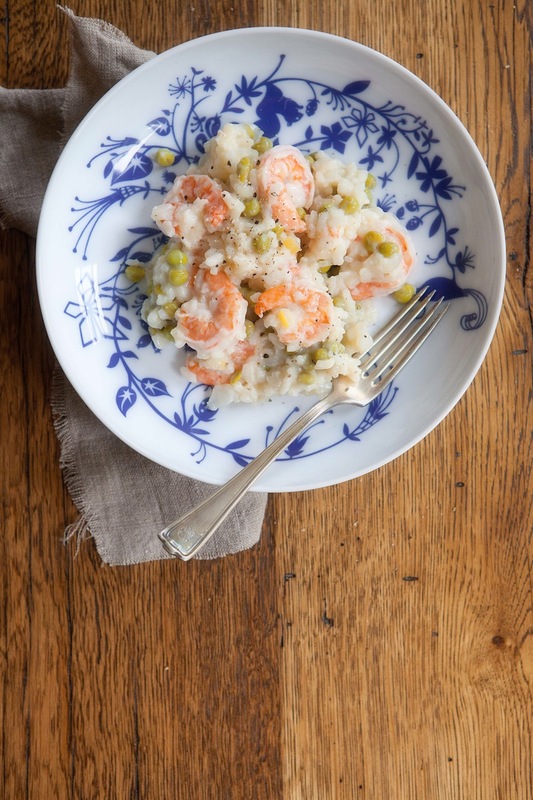 The sweetness of the peas and shrimp are a nice contrast to the energetic tang of the lemon, and they are all offset beautifully by the backdrop of the luxurious rice. I liked it so much, I recently made it again. This time on purpose. 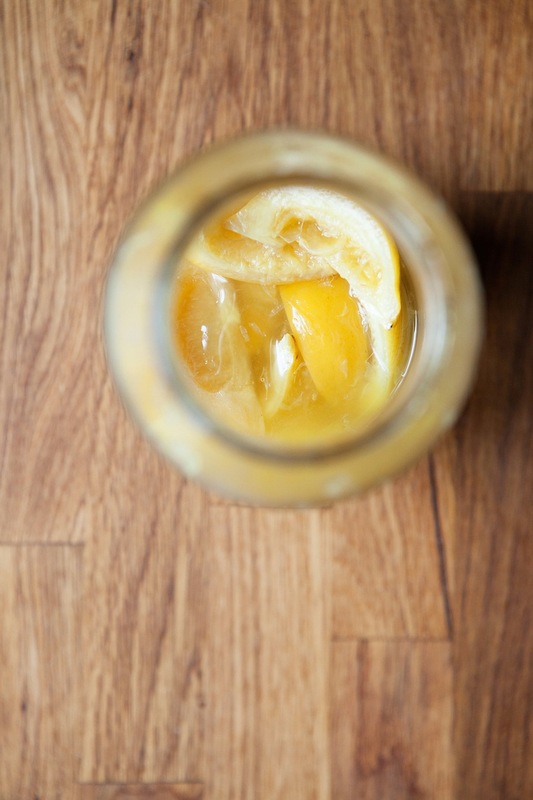 And, I supplemented it with both white wine and the addictive briny citrus of preserved lemons, taking it to new heights. You could grill or saute the shrimp separately and then serve them on top of the risotto, which may make for a slightly more elegant supper. 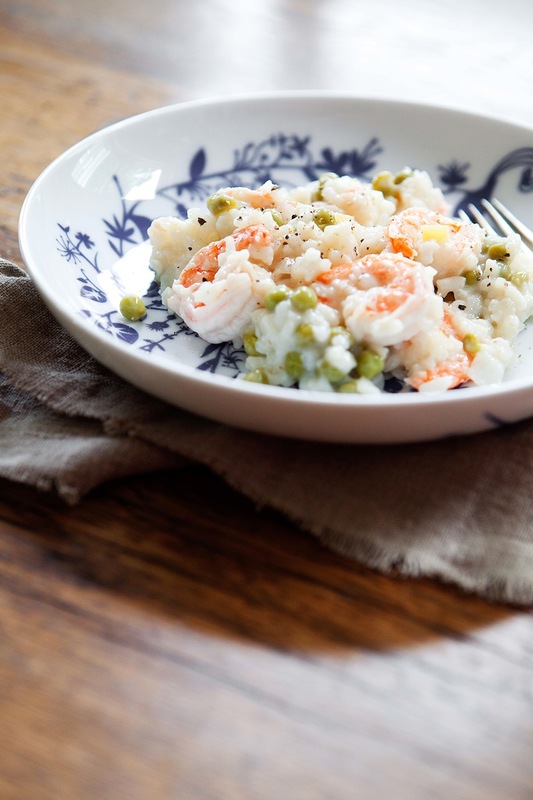 But, allowing the shrimp as well as the peas to cook in the risotto’s heat makes it a one pot meal. And, though it may wear your stirring arm out, one of the magnificent attributes and real selling points of risotto is it makes for quite the one pot meal. In a medium saucepan, heat the stock, covered, until it comes to a boil. Turn off the heat and keep covered. Leave it to rest while you start the rest of the dish. In a soup pot, heat the butter over medium-high heat until it’s foaming. Add the shallot and cook, stirring, until it is softened and translucent, about 3-5 minutes. Stir in the rice. Cook for several minutes, stirring, to lightly toast the rice. Sprinkle with salt. Next, add in the white wine and continue to cook, stirring, until the wine is almost completely absorbed. It should smell amazingly wonderful! Turn the heat down to low or just a little warmer than low. This is where you have to really turn up your patience and your stirring arm stamina. Add one ladleful of the hot broth, and stir until it is almost completely absorbed. Add another ladleful of broth. Stir until completely absorbed. Continue to do this until the rice has just about reached the level of tenderness you prefer. I like my rice almost completely tender, so this can take me around 40 minutes and uses pretty much all the broth. Other people prefer a soupier risotto with crunchy centers to the rice, in which case it may take only 20 minutes. You may not need all the broth. Just check the rice intermittently and go by your taste. When the rice is tender to your liking, stir in the lemon juice, chopped preserved lemons, and the shrimp. Cook – keep stirring! 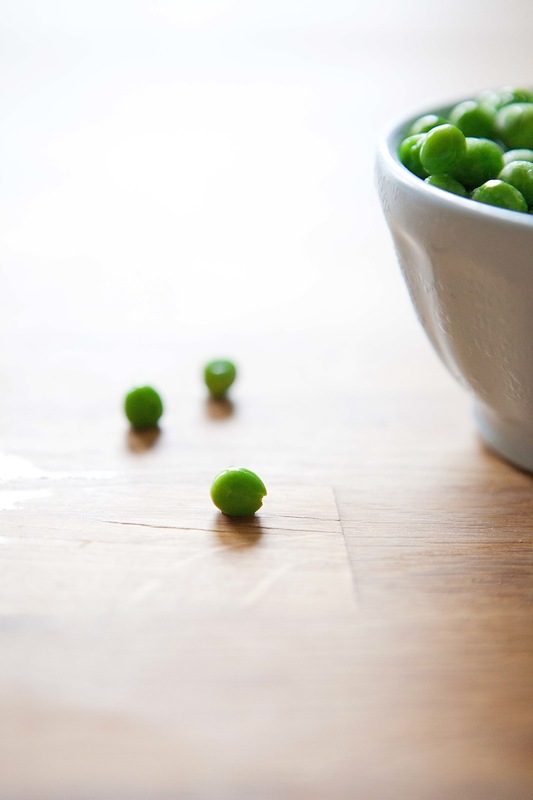 – until the shrimp is just turning pink, then add in the peas. Immediately cover the risotto and take it off the heat. Let it sit for about 5 minutes. Taste and adjust the salt to your taste. If you want more creaminess, you can stir in some mascarpone, but I like the brightness of the lemon, so I don’t. You can also throw in a handful of chopped mint leaves, if you’d like. I can’t remember when I first ate risotto but like you I like to be in control of the pot. I am a bit traditional with my love of the al dente but I don’t like it soupy or with added cream so home-cooked it is. I love Yoram Ottolenghi too, and am always inspired by him – his meringues are amazing 🙂 My fave risotto add ins are roasted uchiri kuru squash & home-smoked tofu. Ooh, that sounds like a wonderful risotto add-in combination. I’ll keep that one in mind. Love risotto, but I so much more frequently think of it in the winter. This will definitely be given a test drive in my kitchen. Thanks for the tip! Definitely give it a try! It’s certainly not a light summery dish like a salad, per se, but it still has a freshness to it. This looks so fresh and delightful! I will definitely be trying this out 🙂 Thank you for sharing! This recipe sounds divine! I have a long love affair with risotto and would live on it 24/7 if I could. Haha, that’s what I’m working my way toward. This sounds great- and your photos are just awesome..thx for posting.. Sounds absolutely delicious. What a treat. Thanks. It’s becoming a favorite! This looks really good. I have never had risotto. This might just be a push to try it. You are currently reading Lemony risotto with shrimp and peas at Five And Spice.